Today was our second last cycling day. We consumed another excellent Turkish breakfast at Hotel Anzac, then set off along the coast road into the north wind, still blowing, but a little less fiercely than yesterday. Çanakkale has two big tourist drawcards – Troy and Gallipoli. The respective films are shown nightly on dvd at the hotel. Çanakkale has been blessed (or blighted) with the Trojan horse from the film Troy, and it has pride of place on the waterfront. Australians tend to be thick on the ground here and we spotted a few. Everything goes mad each year around Anzac Day when over 10,000 people arrive for the annual commemorations. After 10km or so on a minor road we were obliged to join the main road, a four lane highway that cuts a swathe through the countryside in long straight stretches. While not as delightful as a small country road, traffic was relatively light and we had a wide shoulder as far as Lapseki. Since leaving Bulgaria we have been travelling without a map as it has been impossible to buy one. We tried in Bucharest without success, had no opportunity in Bulgaria and have not found anything here either. We are relying on Google maps mainly. So far we haven’t got lost, but we are staying on major roads as we don’t know all the available route options. The area north of Canakkale is a fruit and vegetable growing region with lots of orchards and crops. We could see the Dardanelles to our left with ships going up and down the straits. After a break in Lapseki the road worsened, but road widening in progress gave us a wide unsealed lane to ourselves for much of the way. 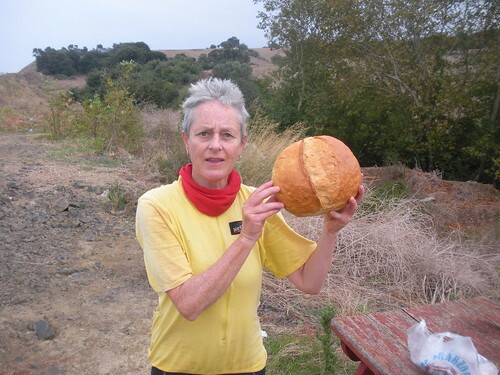 I stopped to photograph a bakery window and ended up with a free loaf of warm crusty bread – yum! 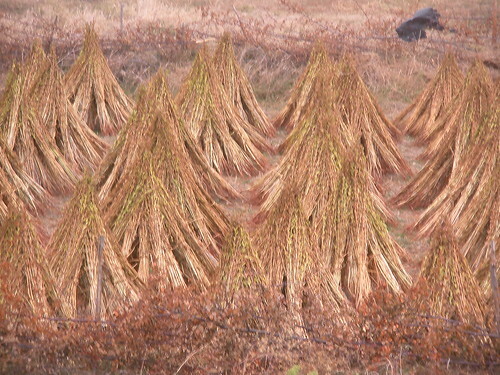 We saw people making stooks in the fields and later confirmed that this was rice. We also passed rice fields still to be harvested. The stooking is very laborious. The rice has been cut and carted some distance to these higher, drier fields where groups of people are working bundling it into small sheaves. Others then stook them. Presumably, when the rice is dry enough it will be threshed. There has been rain overnight and a lot of almost-ripe rice has been knocked flat. Perhaps this manual handling is to retrieve that rice. It would be a daunting task to process the entire harvest like this. A truck with a huge load of red capsicums went past and we saw big plots bursting with capsicums ready to be picked. Every house has a garden with corn, pumpkins, tomatoes, cabbages, chillies or some combination of the above. Lawns and outdoor entertainment areas a la Australian suburbia are unknown here. Our road eventually turned inland and we rode through a forested area before emerging into farming country again. I experienced depression at one stage of today’s ride when I looked at Garmin, which said we had ridden only 41km. I felt sure we had done a lot more but who can argue with Garmin? Ian explained that he (M. Garmin) is not accurate at present because he lacks data. So we pushed on and arrived at Biga, a town that doesn’t feature in tourism universe. It has a lively centre with fine old mosque and nearby fountains for washing. The mosque has a modern feature: a digital scrolling text display that shows the prayer times, date and current temperature. It has been drizzling rain during the day and this is now continuing. Turkey has held a constitutional referendum today. It is canvassing a range of issues to do with military powers, civil and individual rights. While in a cafe we watched some of the television broadcast of the results and it looks like the yes vote is ahead. But the issues are too complex for us to understand fully and we don’t know what % vote is needed for a result. A couple of details: we have become devoted to ayran, a popular cultured milk drink with a slightly salty taste; some restaurants pour eau de cologne (or something similar) on your hands as you leave as a parting gesture; we have been asked a number of times today where we are from and the checkout girl in a supermarket welcomed us to Turkey. This entry was posted on 12 September 2010 at 4:33 pm and is filed under Turkey. You can follow any responses to this entry through the RSS 2.0 feed. You can leave a response, or trackback from your own site. In lowly pomp ride on with smiles. O’er cynic friends and M. Garmin. To see the approaching festivities. What a wonderful hymn. We Googled and listened to the tune. Now having midnight feast: free loaf from today with honey!